Hawaii governor declares state of emergency to tackle homelessness. 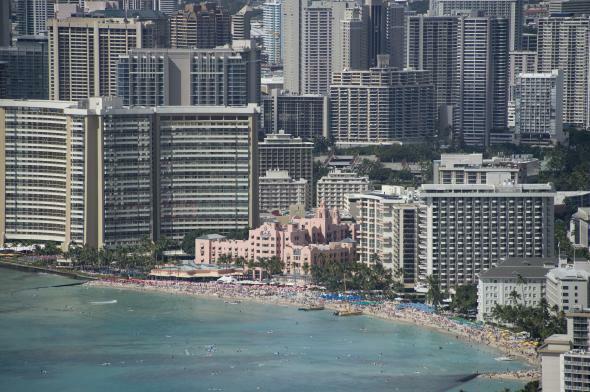 The skyline of the Waikiki neighborhood of Honolulu on Dec. 31, 2014. Usually a state of emergency is declared when there’s a tornado or earthquake. On Friday, however, the governor of Hawaii took the unusual step of declaring a state of emergency in the state to urgently address the problem of homelessness. Hawaii has the highest per capita homeless rate in the country and the number of people without homes has jumped 23 percent in the past year. … [O]n Friday, crews were installing converted shipping containers for Honolulu’s latest homeless shelter on a gravel lot on Sand Island. The rooms in the first units were designed for couples and are 73 square feet… The rooms, which were made from new shipping containers, each have a window and a screen door for ventilation. The structures are insulated, and the roofs have white reflective coating, and an awning will provide shade for relaxing outside, said Russ Wozniak, an architect and engineer from Group 70, an architecture firm. The coating and insulation keep the units about 30 degrees cooler than they would otherwise be, Wozniak said. “The move will help the state speed up the process of building a homeless shelter for families,” the Associated Press reports. “We are making sure that we have options for those who are homeless to move into an emergency shelter, and the biggest deficit in the system is shelter space for families,” Gov. David Ige said at a press conference Friday.